Arsenal doesn’t like doing things straight forward; there’s always some sort of complication that makes an evaluation impossible to bracket as black and white. Tensions are high amongst Arsenal fans; we have been frustrated at the lack of any sort of signings to boost/strengthen the team. We have also spent the last 7 days hearing announcements that Theo Walcott has signed his contract only to discover nothing official from anyone that actually matters in the whole situation. Earlier in the day former player Robin Van Persie again found himself on the score-sheet to take Manchester United 10 points clear at the top, another dig in the ribs of frustrated Gooners. Everything seemed to be falling in place to put Arsene Wenger straight into the firing line if we did not come away from the Man City game with a positive game, performance and result. Leading up to the game there were some signs that something was slightly skewiff. 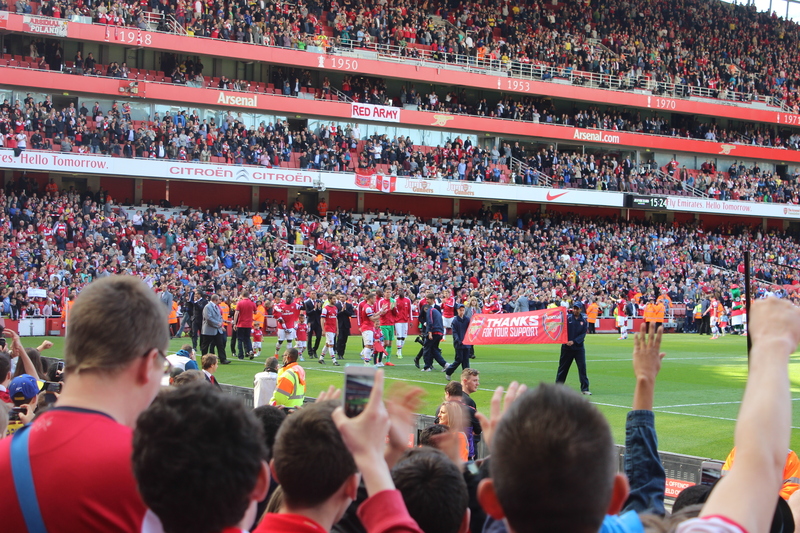 Firstly the news filtered through beforehand that the game was under threat due to a suspicious package being located outside the Emirates that resulted in the area being closed off to the public. The threat was quickly dealt with however rumours circulated that Mikel Arteta was in fact injured and would not be involved in the game, which was proved right and seemed another strike thrown into the mix before we even kicked a ball. The biggest factor to affect our game and pour cold water over the Arsenal fans optimism was the dismissal of Laurent Koscielny just 9 minutes into the game. A game changer indeed and so early in the match that any hopes of winning the game were heavily reduced. For the record it was a penalty, I would not deny that however the award of a red card is debatable. 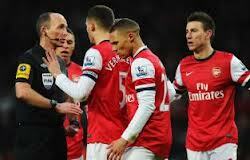 I could talk until I am blue in the face dissecting the decision of Mike Dean but that won’t change anything. It spoiled what had the potential to be a good game and from then on the defeat was an inevitable outcome. The injustice of the red card in a way deflected the rage that was going to be directed towards Arsene Wenger for some of his recent actions, comments and inactivity in the transfer market. You cannot really critique the performance of a team that was handicapped with one less player for the majority of the match. Koscielny didn’t help the situation. Depending on what side of the fence you sit on he either deserved to go or he didn’t. What was conclusive from the incident was he did have his arm around Eden Dzeko and therefore deserved to be penalised for the incident. If he received only a yellow card we still would have had to face a penalty in the first 10 minutes. All season the team have been conceding unnecessary goals and if converted (in the alternate universe where Koscielny received only a yellow) that would have been another on the list. 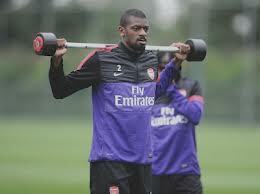 Our French defender although a favourite of many fans, has a knack of the odd silly moments. He has quite a few red cards already during his spell with Arsenal and I think it’s time that Arsene or Stevie Bould had a word with him on being a bit more aware of the consequences of his action when in the box. We can’t rely on Referees to use common sense in games so the best policy is to not give them any reason to make their rash decisions. New players are contributing to their teams. In a so far inactive transfer market for Arsene, fans cannot help but notice that players are scoring for their new clubs. Daniel Sturridge managed to get on the score-sheet earlier in the day with Liverpool, Demba Ba has got off the mark for Chelsea already and looked to have settled at his new club. It’s just a sign to show what kind of impact a new signing could have on the team. I know any new signing would have been just as powerless as the players on the field yesterday once we went down to 10 men and so my argument doesn’t have much standing but I still believe our current squad has gone a bit stale and returning injured players will not revitalize it. New blood is needed the sooner the better. 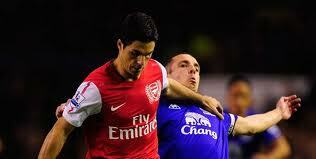 Arteta injury means big problems. The news of Arteta’s injury is not welcome news at all. Arsene has ruled him out for the rest of the month and the question is how do we cope with the loss of our Spanish pass master? Arteta has made the defensive midfield position his own this season and his ever-present season so far hasn’t drawn up the dilemma of where suitable cover would come from. Abou Diaby slotted into the role yesterday however being his first game back after his long absence it will be wishful thinking to believe he can cover until Arteta returns. His body will most likely require some recovery after his shift yesterday, the extra running having to deal with an extra man won’t help at all. The other option on offer is the two young guys could step up to the mark. Francis Coquelin has been on the fringes of the first team all season without ever threatening to oust any of the starting midfielders. With the injury to Arteta, an indication of Wenger’s true belief in the young Frenchman was shown by the manager choosing to play Diaby in front of him. With the games coming thick and fast this January he is bound to get a chance at some point but it’s important to see how he overcomes this first rejection. Emmanuel Frimpong is also back at Arsenal after his loan spell at Charlton and could be in contention for a place; I would expect Coquelin to get preference over the Ghanaian but would not be surprised if he does make an appearance this month. 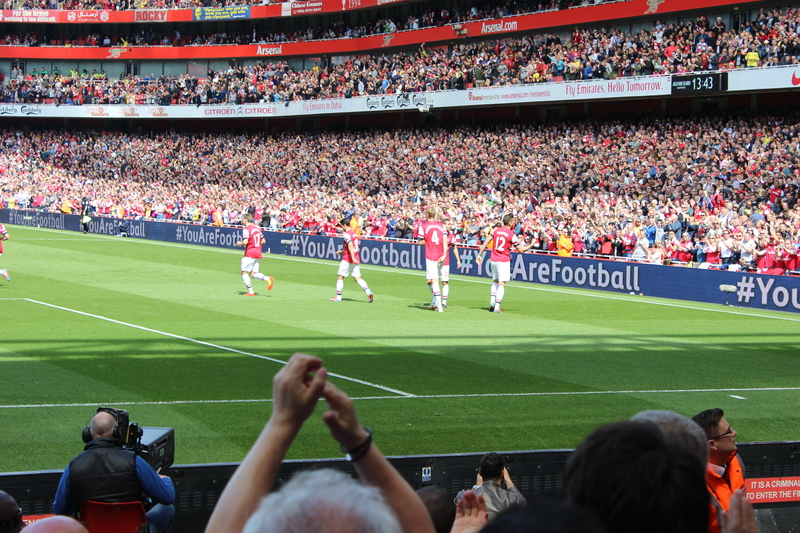 Walcott performances up front need adapting. The longer the contract situation with Theo Walcott continues the more stringent his performances will be critiqued. Once again the young Englishman was given a chance in his preferred position up front but once again he came up short. With a continued run of games he is bound to improve but his contribution in that position needs more variety than just running off the shoulder of the last defender. After the 7-3 victory over Newcastle it was quite clear where Theo’s strengths lied but after that game opposing teams did their homework and decided it might not be best playing a high line against him. This has resulted in him being quite ineffective when he is not running onto long balls. 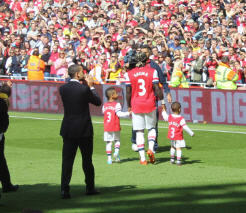 The sending off didn’t help him yesterday as the added contribution of Oxlade-Chamberlain was taken away. There has also been a recent increase in Theo taking set pieces; it does make you wonder if his ongoing contract negotiations are resulting in him receiving special treatment from his colleagues. I think there are players better place to take the set plays and I think he needs to concentrate on scoring goals if he plays as the striker in the team. Once he masters that side of his game then he can expand into contributing to the set plays, you can’t become Thierry Henry overnight after all. In conclusion what I’m trying to say is with all the hassle over the new contract Theo needs to show he has more in his locker to justify the efforts to keep him. It’s starting to look like Wenger will not spend again and so more responsibility will lie on Theo’s shoulders to prove the managers stinginess is the right decision. We now face Swansea in the F.A. Cup third round replay this week, our biggest chance for a trophy this season. Let’s hope the Arsenal can get over yesterday’s result very quickly. Is it time to cut our losses on injury prone players? Going into the united match the squad was weakened by the loss of injured players. Now injuries are not something you can avoid, it happens to all teams, it happens to us a lot but you reach a point where you question whether lady luck is not on your side or whether you do something about it and not have to rely on luck. Abou Diaby is a player I believe in so much, if he was injury free he has the potential to be up there with players such as Yaya Toure. He started the season so well, he produced the performances many fans doubted he had in him and then he got injured. All the momentum and progress lost as he spends another sustained amount of time in the treatment room. We missed his presence on Saturday and there is no real idea of when he will return to the team. Thomas Rosicky although injured playing for the Czech republic over the summer is another player who last season was rejuvenated in arsenal colours. He proved his worth with some awesome displays as we stormed to 4th place in the table. Despite the heroics we find ourselves in an all too familiar situation where Rosicky is spending more time in the treatment room than on the pitch. It just seems the longer we persevere with injury prone players the more the team suffers because when those players are injured we have no other options when first choice players become unavailable. A valuable place is taken in the premier league squad by players who cannot be called upon when required. We have done this for years only for the infamous line ‘like a new player’ to be used every time they return for a 2 game run. Is it time to be ruthless and consider shipping on the more injury prone players? i would find it hard to see us get rid of Diaby but how much longer can we rely on him to play at least 5 games in a row without injury. Before you abuse me this is just a point I am raising, I am not campaigning for us to get rid of any players. 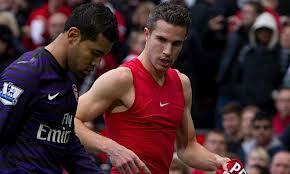 For all the improvements made by Kieran Gibbs at left back his injury record leaves us in the situation where we now rely on Andre Santos to fill the gap, this leads onto my next point. Yes, I know he was torn a new one by Valencia on Saturday but not many full backs do get an easy game against the united winger. Our Brazilian is currently going through a crisis of confidence as the current negativity surrounding arsenal football club has produced a scapegoat. Will he turn around the perception? It’s a tough one to call, all players go through ups and downs and santos is definitely in the middle of a down period. He is being blamed for things that aren’t his fault at times and currently can do nothing right. Santos defending has not been an in-house secret the nation is unaware of. We know his attacking can far outweigh his defensive side. More suited to a wing back role rather than an out an out full back role Santos is often found wanting out on the left hand side. Can it all be down to his positional play or could the addition factors of support and team formation contribute? It is probably a combination of all three but I have to say I don’t agree with the idea of playing Sagna or any other player out of position to fill in at that role. Santos is the specialist full back and it’s a choice Arsene Wenger will have to live and die by. It’s a player he signed and one he will need to assess on keeping or selling at the next transfer window but I think the option of playing an out of position player ahead of him is premature. He can still contribute at left back and if he was dropped for Sagna or Coquelin then there is no point registering him to play for the club ever again. If there is any chance of him regaining his confidence that would be shot to pieces to drop him for those options. Wenger needs to address how the team can help out Santos during his bad spell rather than leaving him to the lions. what we as fans can do to help is to get behind him, as frustrating as it can be at times. never in history has a player raised his game after receiving verbal abuse from his own fans from the stands. we have to make do with him for now so the best we can do is unite and support all the team. OK, moving away from saturday, we have a game today and hopefully an opportunity to bury some demons in the process. a positive result today will go a long way to restoring some pride back. At present it’s not looking good with our squad now weakened by the loss of Aaron Ramsey. One thing Arsenal are good at is pulling off results at our lowest periods in a season. And that is why despite our threadbare squad travelling to Germany a win is not beyond us. The team need to stick together, fight for each other, fight for every ball and make the chances count. it is not beyond us, we are a better team than Shalke, tonight is the chance to prove it. Please feel free to like the Facebook page. Win,lose or draw share your thoughts with me.